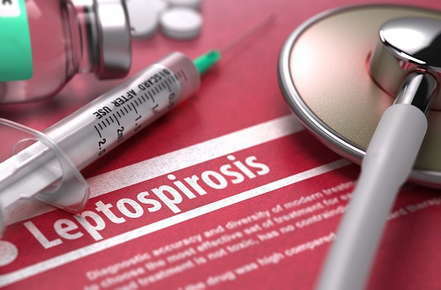 Leptospirosis is a serious, life-threatening disease caused by a spiral shaped bacteria. Dogs, cats, other animals and even people can be infected through exposure to urine, bite wounds, ingestion of infected flesh, or contact with contaminated soil, water and even bedding. Certain environmental conditions can favor the bacteria: standing water, rain, floods and warm moist weather. Pets living under these conditions, especially those who live primarily outdoors or are used for activities like hunting or herding are at a higher risk of being infected. The bacteria can quickly spread through the body causing symptoms like fever, joint pain, excessive drinking and general malaise. Eventually the bacteria settle in the kidneys or liver where it rapidly multiplies leading to organ inflammation, organ failure and possibly death. People infected with Leptospirosis show the same symptoms as pets: fever, joint pain, excessive drinking and general malaise. Most often people contract the disease when their mucous membranes or open wounds come into contact with the urine or other bodily fluids of an infected animal. Repeated blood tests 2 to 4 weeks apart are recommended for diagnosis. This test detects the presence of antibodies the body produces after being exposed to the disease. Recent vaccination against leptospirosis can make diagnosis difficult as vaccines stimulate the body to create similar antibodies. New technology has made rapid tests available and sometimes urine can be used although this test is less sensitive. Samples of kidney tissue can be used but this is rarely done due to the need of an invasive procedure. Fortunately, leptospirosis can be treated with a combination of antibiotics. If kidney function becomes seriously impaired, patients may need kidney dialysis; some patients need this only temporarily while others will need it for life. Supportive care is crucial for pets that become extremely debilitated by the disease. Intravenous fluids help maintain blood flow through the damaged organs. Special precautions should be observed when cleaning up any urine or bodily fluids from an infected patient. Leptospirosis is a zoonzotic disease and vaccinations are available. Unfortunately the leptospirosis vaccine has been linked to a high level of vaccine reactions and while reducing the severity of a dog's illness will not prevent them from becoming carriers of the disease. Therefore this vaccine is given only when deemed necessary after consultation with your veterinarian.